Technically the Aeolos is a three-season tent--but it'll keep you dry even into the snow season -- it's that versatile. You'll pay about $339 for this tent . For the money, though, you'll be hard pressed to find a backpacking tent that offers the same spaciousness and performance characteristics. 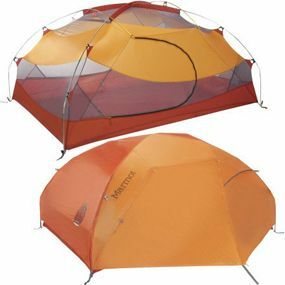 Backpackers and campers who like to travel light marvel at how quickly and easily this tent goes up (check out user reviews at Backcountry.com or MooseJaw to see what we mean!) It uses a stay-put, knee-pole system that facilitates an amazing space-to-weight ratio, resulting in steeper walls. Wherever you like to hike and camp, from the high desert to the coast, the Marmot Aeolos 2 person tent will see you through nine months out of the year -- maybe longer. With the right cold-weather sleeping bag, you can expect to stay cozy even in 20, 25-degree temps. Floor Size: 90 x 56"
Vestibule Size: 19 sq. ft.
Rather than have to step over your tentmate when nature calls in the middle the night, you each get your own door. Similarly, two vestibules allow you to store your gear separately, too. This is big in the morning when you're getting ready to haul out -- you don't have to trip over each other. And together with the optional footprint, it's easy to make the Aeolos 2 person tent a bare-bones rain fly/tent pole shelter when the weather is warm. You can also add an optional gear loft to store some of your stuff above your heads. About the only knock on this backcountry shelter extraordinaire is its price. For serious hikers, though, it's not a lot to spend, especially considering its comfort, interior space and easy setup. Most users agree: the Aeolos 2P is worthy of their recommendation. Anyone who's experienced one of the many Marmot tents available can attest to their ruggedness and reliability. The Marmot Aeolos 2P is no different, combining style, spaciousness and great versatility into a very lightweight package. Esteemed for its sensible, hiker-friendly design, the Aeolos 2P tent is everything you love about Marmot products folded up neatly in your pack and ready for the next challenge. Have you used the Aeolos 2P Tent? 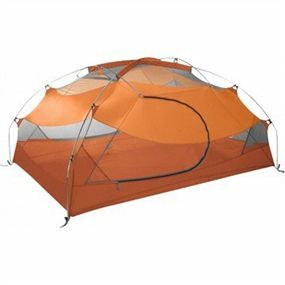 Share your Marmot camping tent review and let us know how it worked for you!